Henry Ford's first production vehicle for the new Ford Motor Company was the 1903 Model A, the precursor to the well-known Model T that made Ford what it is today. 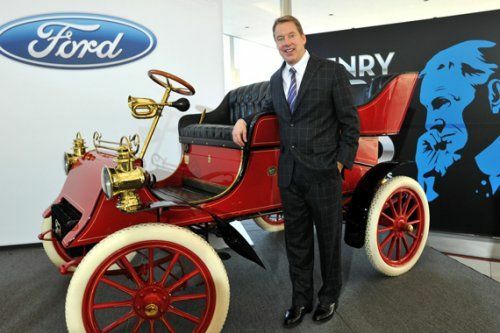 One of those 1903 Model A Fords went to auction in October and the buyer was none other than Henry Ford's great grandson and current Executive Chairman of the Ford Motor Company, Bill Ford. The current-generation Ford brought the first-generation Ford vehicle to the company's home in Dearborn, Michigan and unveiled it to Ford Motor Company employees on Tuesday. The car was part of a kickoff event to celebrate the 150th anniversary of Henry Ford's birth, culminating in a huge Maker Faire birthday bash on July 30, 2013, where the oldest Ford still on the roads, this 1903 Model A, will be the centerpiece. A new website dedicated to the 150th anniversary was also launched at henryford150.com. The celebration of Henry Ford's 150th will happen throughout 2013 as the MotorCities National Heritage Area and the Henry Ford Heritage Association work with other collaborators throughout the year at various events, car shows, tours, dramatic re-enactments, and more. The Model A was instrumental in keeping the Ford Motor Company afloat in 1903. In July of that year, Henry Ford faced his own fiscal cliff, having cash on hand at less than $250. Then, an order for three Model A cars came in, with an up-front payment and deposits of $1,320 to go with, arrived on July 13 and Ford Motor Company was saved. One of those cars, No. 3 off the line, is this car which Bill Ford just acquired. Henry Ford is likely the most influential person in automotive history. While working for the Edison Illuminating Company (yes, Thomas Edison's company), Ford tinkered with gasoline engines and built his first, which he called the Ford Quadricycle, in 1893. Ford left what most would have considered a comfortable career at Edison in 1899 to form the Detroit Automobile Company, but failed to make a go of it. Shortly after that company's dissolution in 1901, Ford and friend C. Harold Wills built a race car that successfully convinced others to invest in his new endeavor, the Henry Ford Company. The next year, Ford left that company (he was chief engineer) because of differences of opinion over how expensive the cars should be and the company renamed itself to the Cadillac Automobile Company. Ford instead teamed up with a famous former racing cyclist, Tom Cooper - sort of the Lance Armstrong of the era - in 1902 and built the 999, a race car with over 80 horsepower. It handily beat another car in 1902 and propelled Ford into a new endeavor, Ford & Malcomson Ltd. Leasing a factory and hiring a machine shop owned by John and Horace Dodge (yes, those Dodges), Ford & Malcomson soon became the Ford Motor Company. In 1903, facing his fiscal cliff, Ford sold three Model A cars and developed the Model T. Now, 110 years later, one of those first three Model A cars is back home in Dearborn.